Winter Design received the 2010 Georgia Urban Forest Council (GUFC) Outstanding Greenspace Grand Award for the Walton Lakes TrailNet project. 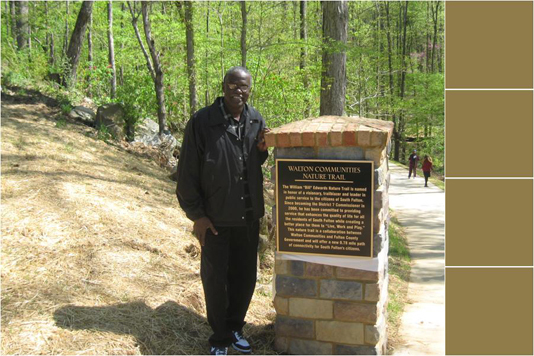 South Fulton County and Walton Communities join forces to create a public trail system that connects public and private land allowing for pedestrian paths through old growth forest. Phase I of master plan travels through Northern border of Walton Lakes The South Fulton Public Trail system is a community improvement amenity that travels, in part, along the Northern border of Walton Lakes. It is a paved, multi-use path about 2.6 miles in length that winds through 53 acres of pristine old growth forest. Winter Design proposed the idea of creating such a trail after evaluating South Fulton's Tree Save Program for Walton Lakes. When it was discovered that fitting recompense trees on the site would hinder the growth of new trees, Josh conceived of the trail system which also makes use of marginal land too steep to develop. Winter Design served as Walton's liaison with government and public entities, negotiated the land, developed master plan drawings including sediment/erosion control plans, guided the project through permitting, and closely supervised all construction. What resulted is a successful public/private alliance with the mission to create a community space that preserves the natural beauty of the land and provides an incredible outdoor experience for all.